Nonfiction, Adult Trade Paperback, Travel/Nature. Paper, 6 x 9, 256 pages with index. Printed on 100% post-consumer recycled paper. Most residents of the eastern United States never get to see an old-growth forest. They think perhaps these forests are too far away, or they don’t know how to find them. Joan Maloof’s Among the Ancients remedies this. In her intelligent, lyrical book, Maloof takes readers to twenty-six forests—one in each state east of the Mississippi River and all open to the public. She tells readers how to get there and what they will find when they arrive. On this journey—from giant hemlock groves in Pennsylvania to a lonely stand of pines in Wisconsin—readers come face to face, perhaps for the first time, with old growth: the forests with the largest trees and the richest diversity of life. They will camp with Maloof under “the Big Tree” in Alabama and paddle to the magnificent Patriarch in Delaware; they will dodge poisonwood sap in Florida’s Lignumvitae Key and tangle with a bat in the Michigan wilderness. They will also see the forests from the human perspective: who had the dream, who drew the line, who said “no” to the loggers. And they will learn about the vital link between old-growth forests and our own survival. 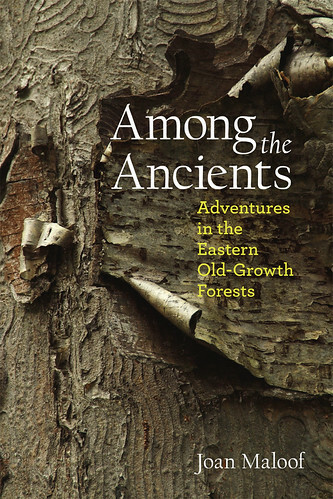 An immensely readable natural-history primer, Among the Ancients is also an adventure story and an impassioned plea to preserve and support the few untouched stretches of forest that remain.